As a fantasy digital artist Sandara has created a remarkable impression through her digital paintings to the community. She has been a member of DevianArt community for past 13 years. Her captivating dragons are breathtaking and various other fantasy beasts created by her are incredible. Apart from her artistic works she also encourages her co artist through her tutorials and instructive comments. Watching Sandara's Gallery is like watching a movie or playing a video game as it has a number of fantastic scenes and fierce creatures. 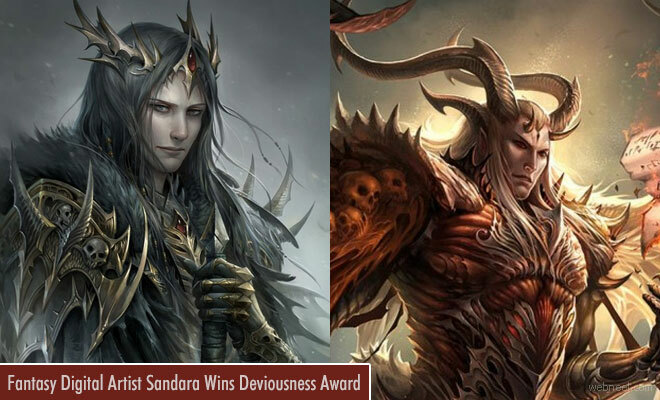 To honour her good work as a fantasy digital artist DevianArt has awarded Deviousness Award 2017 to Santara. Enjoy the fantasy digital art works of Santara here.